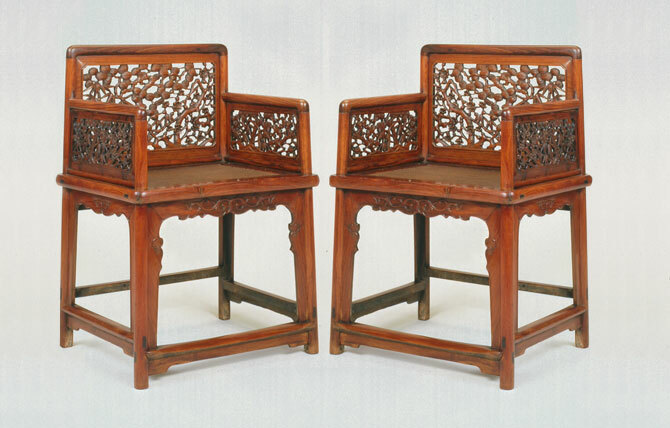 A PAIR OF LATE MING OR EARLY QING DYNASTY LOWBACK ARMCHAIRS WITH CARVED THREE FRIENDS OF WINTER OPENWORK PANELS. Height 40 in. (83 cm. ), Width 23 in. (57.7 cm. ), Depth 18 in. (46 cm.) Circa 17th Century. For a more comprehensive and detailed discussion of our example, please see Nancy Berliner’s Beyond the Screen: Chinese Furniture of the Sixteenth and Seventeenth Centuries, Plate No. 12, 1996, The Museum of Fine Arts, Boston (where these chairs are currently on display); and Sarah Handler’s Austere Luminosity of Chinese Classical Furniture, Plate 6.10, 2001, University of California Press. Formerly in the holdings of Ming Furniture Ltd. these exquisite chairs are now in the collection of Edward C. Johnson 3rd. and can be viewed at the Museum of Fine Arts, Boston.